Watt's Up? : What is Dynamic Current Correction? 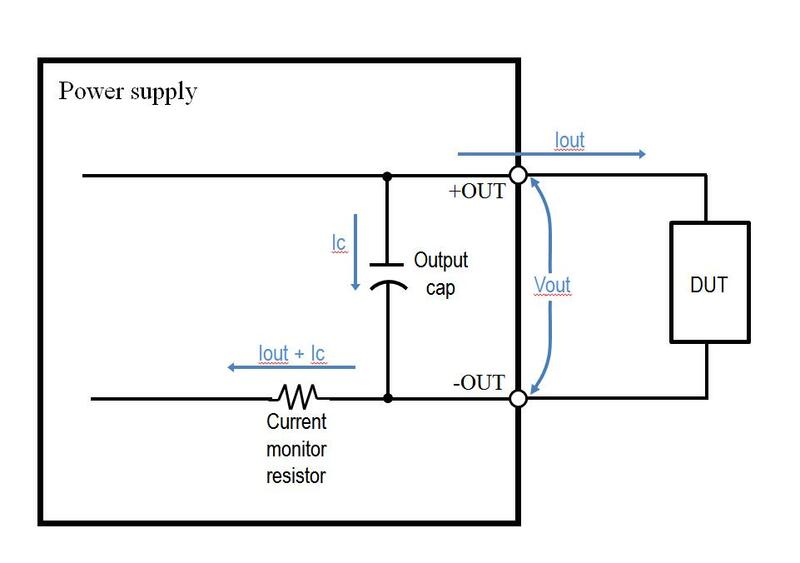 If you look at the above figure, the current monitor resister is inboard of the output capacitor. This means that our current measurement system is going to measure both Iout and Ic when we take a current measurement. Ic is not in any way being sent to the output of the power supply and the DUT will never see this current, the DUT will only see Iout. We wanted to provide a way that you can see the actual current that is going through the DUT so we offered the Dynamic Current Correction option in our current ranges. Since we are talking about a capacitor here, remember that the current through a capacitor equals the capacitance multiplied by the change in voltage over time (I = C * dv/dt). If you are making a measurement at a DC voltage level, then there is no current through your capacitor since your dv/dt is near zero. 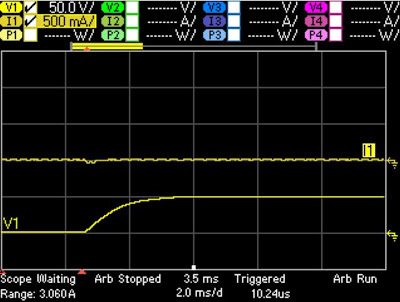 When you have a rapidly changing voltage waveform you can have a large dv/dt and your Ic will be a non-zero number. A good rule of thumb would be that you want to use the dynamic current correction when you have a changing voltage and you want to turn dynamic current correction off when you have a DC voltage due to reasons that we will get into later. 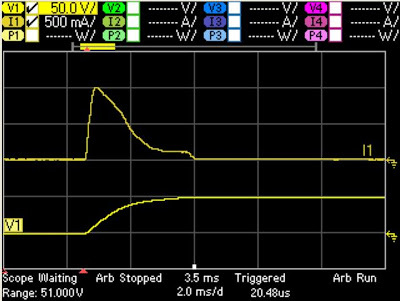 In the below screenshot from my DC Power Analyzer I am operating an N6762A module set to go from 0 to 50 V with nothing connected to the output. I do not have the Dynamic Current Correction range selected. You can see here that the measured current goes up to 1 A even though the output is completely open therefore limiting any current flow. That current is all flowing through the output capacitor due to the dv/dt of going from 0 to 50 V. In this screenshot, you are seeing all Ic from the diagram above since Iout is 0. This is not representative of the DUT current. In this case we are going to want to use Dynamic Current Correction. As you can see, with Dynamic Current Correction turned on, the effect that the capacitor current has is much less noticeable. With a changing voltage, you definitely want to have this enabled. When Dynamic Current Correction is on, the power supply is using the capacitor equation (I= C* dv/dt) to calculate what the capacitor current is and then subtracting the calculated value out of the measured current. This is a more accurate representation of the output current flowing through the DUT (Iout in the first picture). There are tradeoffs though. 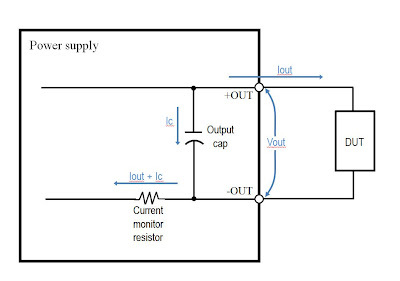 In some models dynamic current correction will increase the peak to peak current measurement noise and it can also limit the output measurement bandwidth. These factors are the reason why you should turn it off when you are operating at DC voltages. The moral of this blog post is that you want to use the Dynamic Current Correction when you have a rapidly changing voltage and not use it when you have a static voltage. Please let us know if you have any questions. Which of your power supplies have this useful feature?